DAHLGREN, Va. --- The power of a Navy strike group's interoperability with unmanned vehicles, surface and air assets, guns, missiles, and combat systems was proven at the 2017 USS Dahlgren demonstration, Sept. 13-14. Hundreds of visitors - including 40 distinguished visitors from military, government, and academia - observed this power at the Annual Navy Technology Exercise (ANTX) as the USS Dahlgren's capabilities were demonstrated. The cybernetic ship simulated the USS Dwight D. Eisenhower (CVN 69) strike group, hitting targets virtually and with live fire via Littoral Combat Ship (LCS) 30-millimeter guns and Aegis MK 46 gun system 5-inch guns on the Potomac River Test Range. ANTX featured virtual and hardware representations of combat systems on the Eisenhower strike group that comprised USS Gridley (DDG 101), USS Fort Worth (LCS 3), USS Milwaukee (LCS 5), USS Freedom (LCS 1), and USS Mason (DDG 87) during live fire destruction of surface threats. Throughout the event, an MH60R helicopter, an MQ-8B MQ-8 Fire Scout unmanned autonomous helicopter, a Scan Eagle unmanned aerial vehicle (UAV) and a USV identified and tracked threats over-the-horizon. At one point, an autonomous unmanned surface vessel (USV) - equipped with an inert front-end portion of a Longbow Hellfire missile - staged simulated Longbow Hellfire salvos. The air assets - upgraded with enhanced radar technologies - and the USV provided real-time targeting throughout the exercise. Track and engagement information was shared across the strike group proving an ability to conduct experimentation in a high-fidelity, distributed architecture. "We are showcasing all of the good work that we and the NR&DE (Naval Research and Development Establishment) have done, and the seriousness of our role to close the gap for the warfighter," Naval Surface Warfare Center Dahlgren Division (NSWCDD) Technical Director John Fiore told the visitors before the exercise commenced. "Our partnership with industry, academia, and our brothers and sisters in the NR&DE is critical because the only thing we're here to do is to take care of the Sailors and Marines who are out there and have to be effective and want to come home to their families safe." To keep warfighters safer, the U.S. Navy plans to integrate remote sensors that feed target location data to ship combat systems. This will enable Sailors to immediately engage fast attack craft and fast inshore attack craft as well as other threats with existing gun and missile systems and emerging electric weapon systems. Currently, the integration of unmanned systems into the Fleet has been limited by a lack of direct communications with shipboard combat systems. "Our sole purpose here is to identify where the warfighter gaps are and understand how we close those gaps," Fiore emphasized to all regarding the event, hosted by NSWCDD in collaboration with Naval Air Warfare Center Aircraft Division and NSWC Panama City Division. 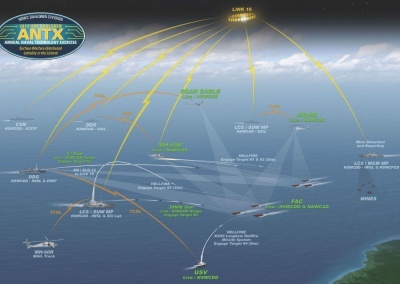 The visitors, including NSWCDD employees, saw Dahlgren's ANTX address these integration challenges via a layered defense demonstration focused on distributed lethality in the littorals and rapid prototyping of new Fleet capabilities. What's more, they witnessed emerging and innovative technologies align with future naval capabilities and had the chance to share new technologies, exchange ideas, and collaborate with the surface naval technology community. "The ANTX demonstrations have been a valuable way for Marines to see targeted capabilities the Naval Warfare Centers are working on, opening the door to further discussions of future capabilities and the art-of-the-possible," said Meggan Schoenberg, Combat Direction Systems Activity Dam Neck's science advisor to the Marine Corps Forces Command. In effect, the USS Dahlgren exercise gave Schoenberg and many others an opportunity to evaluate the art-of-the-possible at the research and development level in a low-risk environment before these technological innovations become militarized and integrated at the operational level. ANTX partnered with NR&DE, universities, and industry to demonstrate emerging capabilities and innovations in surface warfare. More than 60 emerging and innovative technologies were highlighted that provide an advantage to distributed forces, including naval surface combatants, to exercise sea control across a wide area extending into the littorals. Some of these relevant technologies include integration and control of unmanned vehicles, advanced sensors and sensor integration, track management, data fusion, and tactical displays. Technologies aligning to future naval capabilities were demonstrated, allowing the surface naval technology community to see new technologies, exchange ideas, and foster collaboration. 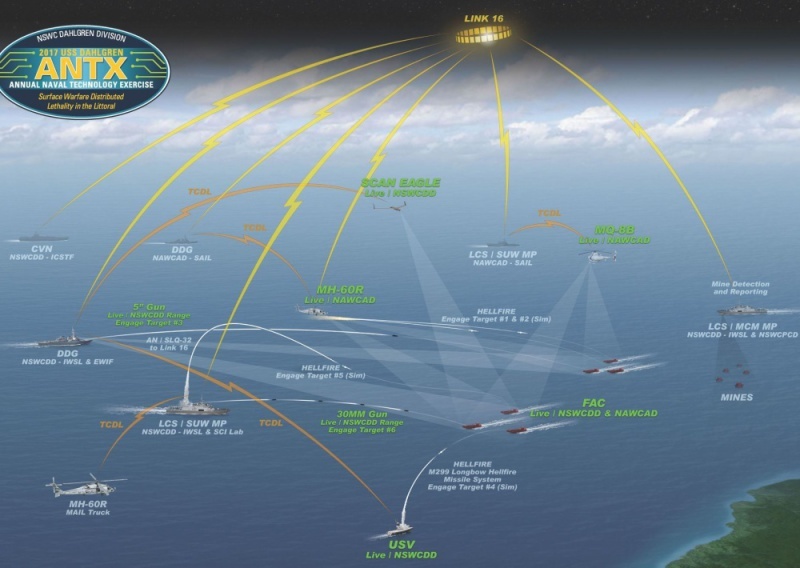 "The ANTX events provide the Fleet a first-hand opportunity to see what the warfare centers are working on in an efficient and relevant way," said Dr. Marcus Tepaske, U.S. Fleet Forces Command science advisor. "I was impressed with many of the 219 NISE (Navy Innovative Science and Engineering) projects and their alignment to naval systems and naval needs. It's great to see what can be accomplished by leveraging the Warfare Centers' internal development funding and engineering creativity. On the other end of the spectrum, the live fire scenarios showed how Dahlgren is pulling all of the pieces together to conduct end-to-end surface engagements jointly with Pax River (Naval Air Warfare Center Aircraft Division). I'm looking forward to future ANTX events across the Navy as they continue to mature and evolve in order to demonstrate even more capability for the warfighter." * First demonstration of the newly integrated MQ-8B Fire Scout unmanned autonomous helicopter radar with LCS Combat System and Link 16. * First prototype demonstration of a USV with the Battle Management System and Longbow Hellfire missile-launcher. * First USV receipt of Unmanned Aerial System (UAS) cursor on-target data. * First LCS Surface-to-Surface Missile Module simulated engagement from UAS targeting data. * First employment of the NSWCDD-produced LCS Combat Management System (CMS) Portable Virtual Test Environment. * First demonstration of the NSWCDD-CMS Integration Laboratory (first Navy-owned LCS CMS laboratory). * First demonstration of the LCS CMS Integration Lab connectivity to remote Mine Countermeasures Mission Package laboratories. * First demonstration of a MH-60R Seahawk helicopter with a newly upgraded system configuration in the USS Dahlgren Link 16 environment.